Every man is conscripted into the Swiss army training once they have finished school, and once training is complete, they are required to possess a gun in case they are ever called to fight for their country. Their countless tunnels have explosives either end of them, in case they are attacked; they are able to barricade the enemy inside. Welcome to the neutral country of our tour. The “Ooh-aah tunnel”, as our guide referred to it as, produced just that result as we emerged onto a scene straight out of paintings and postcards: snow-capped peaks with adorable little villages nestled in the valleys below. We had some kind of traditional swiss sausage, venison, with a traditional swiss potato dish for dinner, and the South African boys tasted the local beer at the hotel’s bar. The hotel was even nicer than the one in Paris, very cute and cosy, with a lot of wood (panelled flooring and walls). 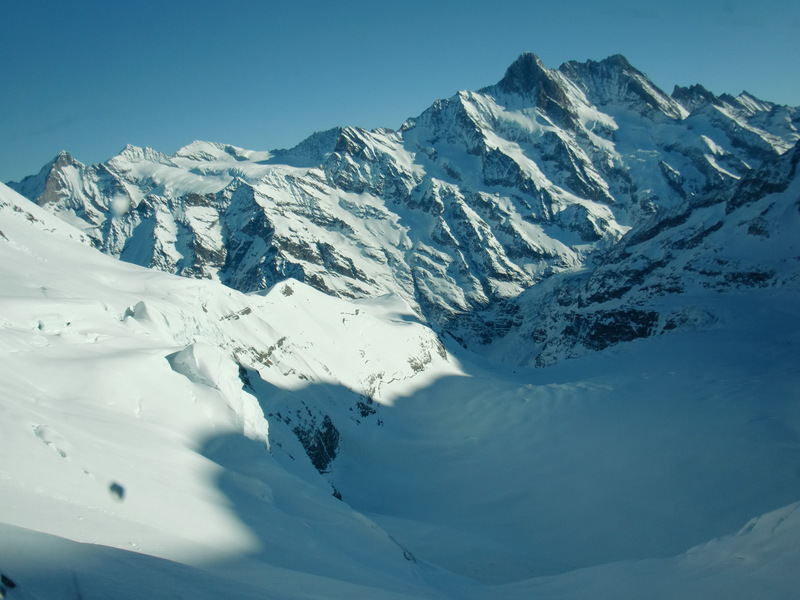 Our free day in Switzerland took us up the Jungfraujoch for quite a hefty price, but it was certainly worth it as a once in a lifetime opportunity. 2 of the group decided to go skiing instead, and I was disappointed that I didn’t get to do that, but we did reach a highly entertaining compromise. Atop the Jungfrau were magnificent views of the villages below, the traditional houses were a nice break from the city building of Paris. There was snow everywhere of course, and no image could capture the beauty of the landscape: in a photograph there is less depth, and it just looks like snow, as opposed to the undulations of sparkling fluff which occasionally made way for the harsh peaks of The Ogre, The Monk and The Virgin (Jungfrau). 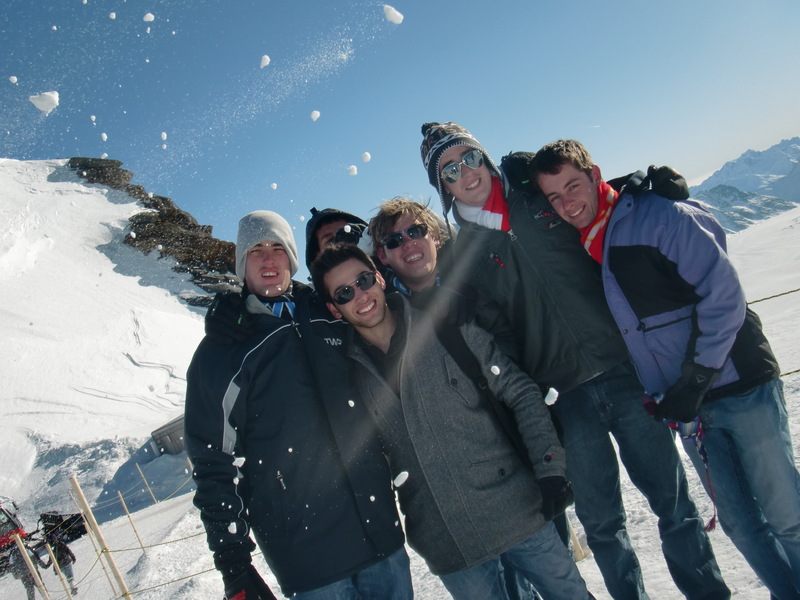 At the Top of Europe, our South African boys had shirtless photographs, to the delight of other visiting groups who insisted on having photographs with these crazy South Africans. We had snow fights on the observation deck that was reached by an extremely long elevator, a ride down which resulted in me fainting, much to Kirsten’s delight, my exasperation and the shock and horror and worry of the boys with us (a reaction I found entertaining). 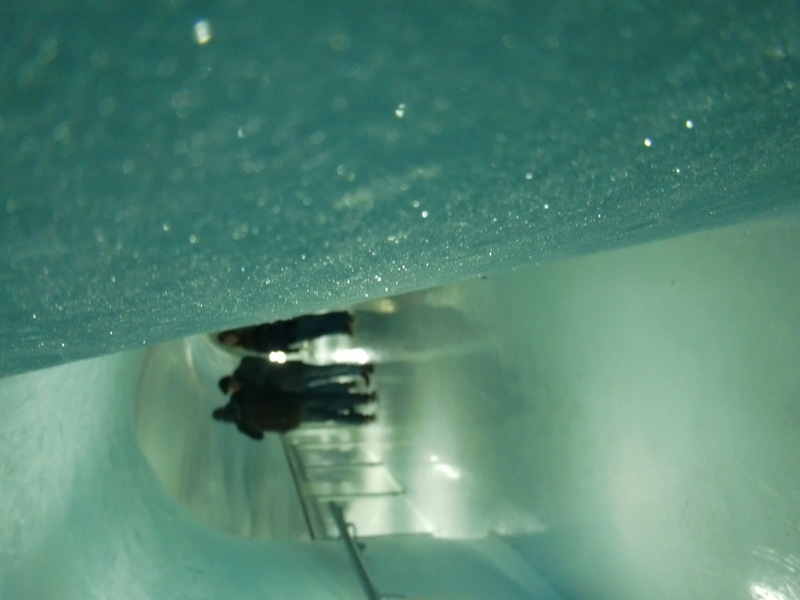 We also tried to slid along the floors of the Ice Palace, which was beautiful, but not as slidey when you wanted it to be. 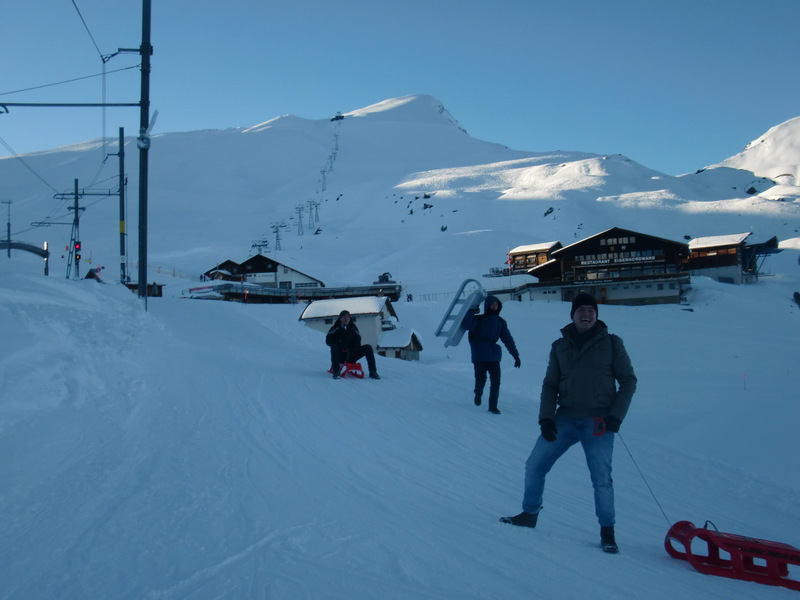 While we felt 150 Swiss Francs was quite excessive, without proper “snow fun” (the section for that is closed in winter) or even a ski in Switzerland, we were pleased to discover that we could hire sleds for only 10 Swiss Francs. So, with little to no experience, our group of 9 tobogganed down to Grindelwald. There were many epic bails, and one of the group even nearly lost his sled, the deposit to which was on MY credit card, but thank goodness for trees. We made it to our train on perfect time, and just when we ran out of light, and sent our sleds back up the mountain for only 5 more Francs. 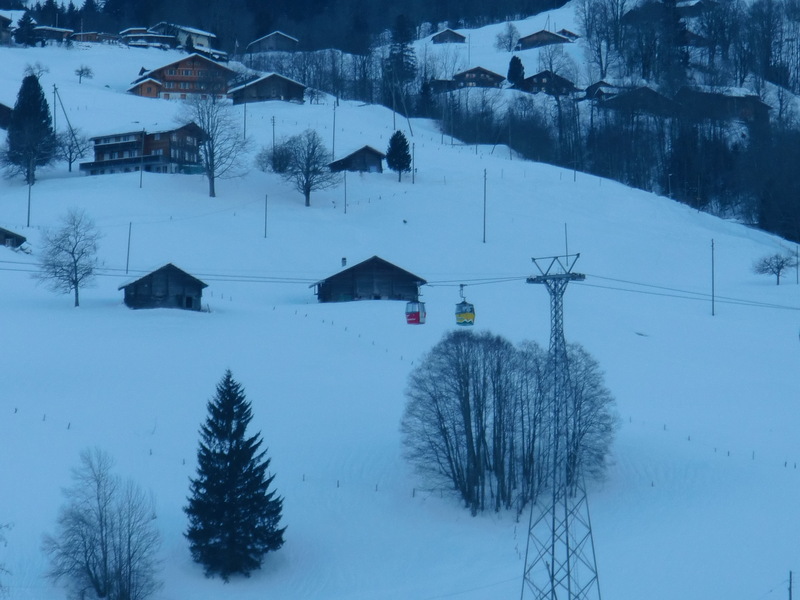 Switzerland was idyllic and the group agreed that it was definitely on their returning lists, especially for the skiing which we hadn’t had enough time or money for on this particular trip. Thank you for the wonderful trip down memory lane. I visited Switzerland for the first time when I was your age and my experiences were exactly the same – hard to describe the majestic beauty and sheer vastness of perfect, clean, crystal whiteness. We’ll go skiing and snowboarding, somewhere, some day – hopefully soon! Hi, which hotwl you stay in Jngfrau? The place we stayed was really lovely and cosy. Felt very Swiss-cottage, and the food was also rather great.